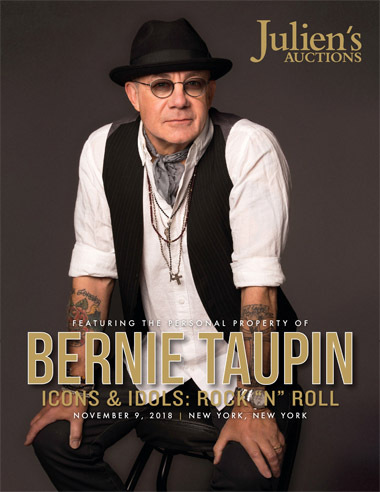 Join Julien’s in New York City at the Hard Rock Cafe live on November 9th, 2018 and online at www.juliensauctions.com for an unprecedented event as we salute one the greatest songwriters of all time with THE PERSONAL PROPERTY OF BERNIE TAUPIN. This spotlight music artist auction event celebrates the 50th anniversary of Bernie Taupin’s writing partnership with pop culture icon Elton John whose fabled collaboration produced some of music’s greatest hits of all time including, “Rocket Man,” “Goodbye Yellow Brick Road,” “Your Song,” “Candle in the Wind,” and “Daniel,” earning more than 30 gold and platinum albums together and worldwide renown as one of pop music’s greatest songwriting duos. 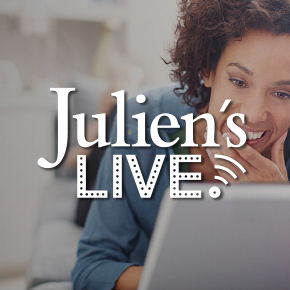 The event kicks off Julien’s two-day music auction extravaganza with ICONS & IDOLS: ROCK-N-ROLL taking place in the afternoon of Friday, November 9th and morning of Saturday, November 10th. Highlights from the collection on offer include Taupin’s original, annotated lyrics to some of his classic creations (various estimates) including “Candle in The Wind 1997” tribute to Princess Diana, typed sheets with alternate last verse lines handwritten; original lyrics to “I'm Still Standing” from 1983’s Too Low For Zero; original lyrics to Starship’s 1985 hit “We Built This City,”; handwritten lyrics to Heart’s “These Dreams,” “Nikita,” “Mendocino County Line”; “A Love that Will Never Grow Old” Taupin’s Golden Globe winning composition from the film Brokeback Mountain and from the album Captain Fantastic and the Brown Dirt Cowboy “Gotta Get a Meal Ticket,” “Better Off Dead,” “Tower of Babel” and from Tumbleweed Connection, original handwritten lyrics to “Ballad of a Well-Known Gun,” along with handwritten lyrics to the John Lennon tribute “Empty Garden” and Taupin’s original notes for “Philadelphia Freedom”, written by Taupin and John for tennis star Billie Jean King. The auction will also feature platinum and gold record awards, clothing, photographs, jewelry, western ephemera, music memorabilia, decorative arts and more. A highlight of the event will be Taupin’s leather desk chair in which he wrote many of his hits over the last several decades.